The Bat symbol is beamed above the rain-lashed rooftops of Arkham City. To escape Arkham City, the World’s Greatest Detective will need to enlist the help of a certain Cat Burglar. Two-Face still wants your vote. Discovering the Riddler’s secrets is easier if you use a little persuasion. Batman uses Detective Mode to locate a sniper. The line launcher gives Batman a unique perspective on Arkham City’s inmates. 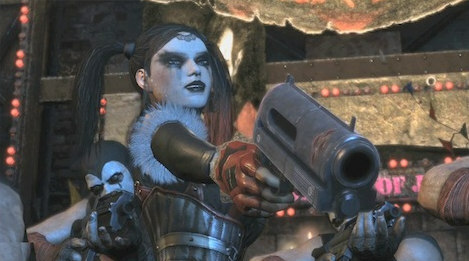 When outnumbered in Arkham City, multitasking is a must. Would you trust this woman with your Human Resources? Taking down multiple enemies is no trouble for Batman. Batman decides two heads are better than one when contemplating a double-takedown. Batman makes an explosive exit from the Medical Centre.